5 September 2008 is the deadline for entries into Quilt National 2009, an international contemporary textiles exhibition held at The Dairy Barn Arts Center, Athens, Ohio USA. Start planning your entry now! We are especially looking for white glove quilt monitors for Sunday at the quilt show. If you are entering a quilt in this year's show, it's time to check that your quilt is correctly labelled with a hanging sleeve/velcro strip (as applicable) and to make contact with your "Drop Off Lady" regarding delivery of your quilt. Quilts must be delivered to Drop Off Ladies by Wednesday, 4 June. Finally, this week is your last chance to purchase tickets for the Gala Dinner. Don't miss out! Over 80 quilts by members. Many new and old quilts for sale. Spectacular raffle quilts. Tea, coffee, scones and sandwiches. Quilt Shop - Material Obession. Proceeds to Redkite - supporting children, young people and their families through cancer. Enquiries: Kathie de Palo (Show Coordinator) 9817 5131 or Audrey Lindsay (President) 9449 9076. The next general meeting is at Burwood RSL (96 Shaftsbury Avenue) on Saturday, 31 May at 1pm. Before the meeting, at 11am, Brenda Smith will be demonstrating some alternatives to binding quilts. She will also be the guest speaker at the meeting, presenting a selection of her vibrant quilts (including her contributions to the Twelve by Twelve Collaborative Art Quilt Project) and discussing the role of serendipity in quiltmaking. Pick up some goodies from Oatley Cottage, the shop for this meeting. There are also a number of door prizes. Non-member guests are welcome. Forster Arts & Crafts is one of the largest community arts and crafts centres in NSW. Their inaugural Quilt & Craft Exhibition in 2007 was such a success, with several hundred people attending, they have decided to make it an annual event. Last year over 60 quilts and wall hangings were displayed together with many other members' crafts and another 150 Quilts of Love made for Ronald McDonald Family Respite Beach House. Don't forget to reserve your place at the Gala Dinner. Bookings with payment must be received by Friday, 30 May 2008 at the Guild office. 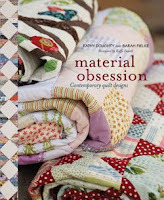 Come along for great company and a sumptuous dinner as well as an presentation from guest speakers Sarah Fielke and Kathy Doughty from Material Obsession, who have just released a book with the same name. Mains: Roasted beef sirloin with honey roasted veges and onion gravy OR orange marinated duckbreast with potato bundled veges and maidera jus. Please contact the venue directly on (02) 8217 4000 regarding any specific dietary requirements.) Disabled access is available. The aim of the expo is to raise money for cancer care services at Wyong and Gosford Hospitals and the Cancer Council of New South Wales. For information.please contact Jan on (02) 4393 1576. A Guild member from the Netherlands is proposing to travel to Sydney for the quilt show next month. She's planning on spending four or so days at the show and has visited Sydney before. She would love to stay with an Australian quilter from Monday - Monday (9-16 June). Tonny has her own quilt shop! and is an experienced quilter. Please telephone (NOT e-mail) the office on 9283 3737 if you are interested in having Tonny to stay. Australian Homespun is proud to announce their search to discover Australia’s best young craft designer. If you, or someone you know is 18 years of age or younger, on 25 July, 2008 (the official closing date of the competition) start creating and designing a project suitable for publishing. Conditions of entry and forms can be found in April, May & June issues of Homespun. Entries close on 25 July 2008. The Arcadian Quilters are holding their annual quilt exhibition at Swane’s Nursery Glasshouse, 490 Galston Rd, Dural NSW, featuring a display of members’ work, a raffle quilt and trading tables. All proceeds go to cancer research and local charities. Open: 9am-4pm. Entry: $5 (children free). For information, call Maxine O’Toole (02) 9653 1380. Australian quilt artists are invited to submit an entry into the forthcoming My Place exhibition. Entries close on 23 June. The exhibition will travel to South Africa for the South African National Quilt Festival 2008, before touring other venues in South Africa, New Zealand, Australia and Europe. The quilts will be displayed at Taia Textile Gallery, Wellington during Symposium 2009 (New Zealand). Entries must be 50 cms x 50 cms (square) finished. Entries may be any kind of fibre art. Each selected artist will provide a photograph of themselves plus a 75 word statement that describes the inspiration for their "My Place" themed piece. Entry submission will be due on 23 June 2008 ( please not Express post delivery does not operate to the organizers’ address). Selected works must be delivered by 15 July 2008.
administration and the return of quilts. The work will be available to travel for 2 years and will not be released during this period. See the entry form or contact Dijanne Cevaal for more information. Due to an administrative hiccup, quilt show acceptance letters (including your exhibitor ribbon and Drop Off Lady details) will not be posted out until later this week. In the meantime, please note that all 344 quilt show entries that were received by the closing date have been accepted. If you have not already done so, please complete and return your Volunteer Form to the Guild Office.